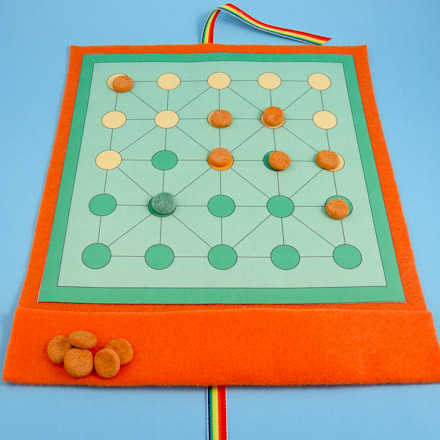 In this project, make a roll-up game board for the game of Catch the Hare that includes a pocket for storing game pieces. 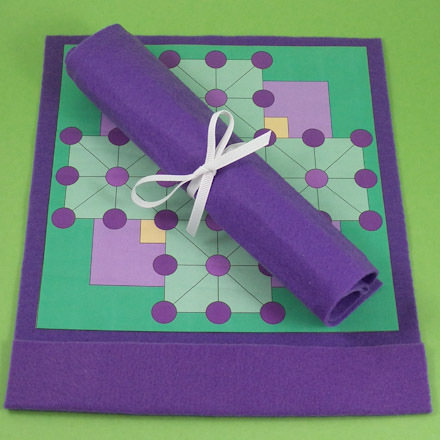 The game board is made of paper and felt using iron-on adhesive, and requires no sewing. This Moorish hunt game is known as Cercar La Liebre in Spain and dates back to the 13th century. Catch the Hare is a classic hunt game from Spain where a single hare tries to escape 12 hunters and the hunters try to trap the hare. The game requires some strategic thinking and the ability to look ahead a few turns. Included at the end of the project are rules for playing the game of Catch the Hare. For some history about hunt board games, see the Fox and Geese craft project. Related craft: Use Modeling Dough to make game pieces. Related craft: The English version of board solitaire uses the same game board as Catch the Hare. Use the game boards in this project to play board solitaire or make the game boards in the English Board Solitaire craft project for playing Catch the Hare. Choose a game board to make. Download and print the pattern. 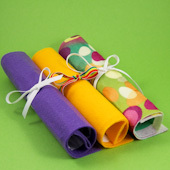 Choose a design that prints in color, or select a black & white pattern and use your creativity to add color and designs. 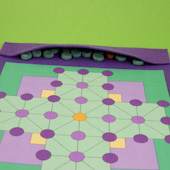 Easy Game Board: These patterns can be used to make a simple "print, cut and play" game board. Just follow the instructions in the English Board Solitaire craft project. See the Fox and Geese Game Board craft project for the step-by-step instructions for making the felt game board. Easy Game Board: You can also make a simple "print, cut and play" game board. Just follow the instructions in the English Board Solitaire craft project. You will need 13 playing pieces in two different colors (1 hare and 12 hunters) to play Catch the Hare, also known as Cercar La Liebre in Spain. You can use pieces from other games, coins, marshmallows, or dry cereal (Trix). You can even make your own pieces with homemade Modeling Dough. The object of the game is for the hunters to trap the hare and the hare to avoid being trapped. The game is played by two players, with one player using the single hare piece and the other controlling the 12 hunters. Don't worry that the hare is outnumbered—it has the special ability to jump. Place the hare on the center space and place the 12 hunters on the first and second rows, and the outsides of the third row, as shown by the yellow. include diagonals, so you might want to try playing without making diagonal moves. The hare may capture the hunters by jumping. No other pieces are allowed to jump. A capture is made by jumping over a piece. A captured piece is removed from the board. All jumps are over an adjacent piece to an empty space beyond. Multiple jumps are allowed. Draw to see who goes first, then take alternating turns. The hunters try to crowd the hare into a corner and trap it. The hare tries to capture as many hunters as possible. When the hare is trapped (can't move), the game is over and the hunters win. The hare wins when it becomes impossible for the hunters to trap it. That's it! Have fun playing your hunt game! 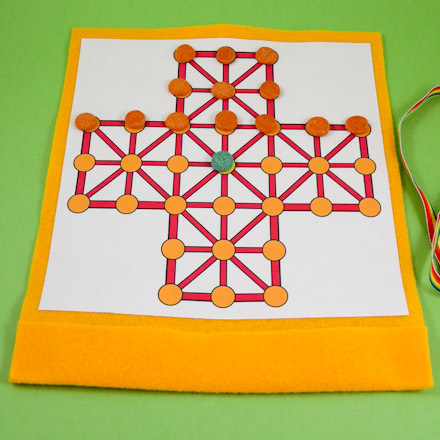 Tip: The felt game board includes a pocket to hold the game pieces. The pocket is folded over to hold the pieces in when the board is rolled up. Tip: Select felt and ribbon in colors that coordinate with the game board. Game pieces in similar colors are nice, too. Tip: Roll the game boards loosely.